The Australasian swamphen (Porphyrio melanotus), family Rallidae, is a species of swamphen occurring in eastern Indonesia, the Moluccas, Aru and Kai Islands, as well as in Papua New Guinea and Australia. It is also found in New Zealand where it is known as the Pūkeko, derived from the Māori language. 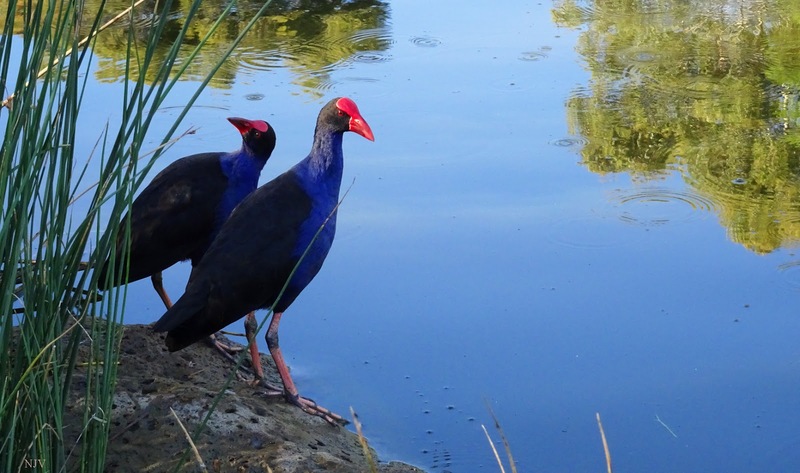 The Australasian swamphen previously was considered a subspecies of the purple swamphen (Porphyrio porphyrio). In New Zealand and Australia populations have expanded due to the creation of new artificial lakes and ponds. Birds are often seen singly, or in groups of two to three, foraging for food beside motorways or roadside ditches, and collecting grit. A study showed that the preferred grit colour is red (followed by yellow and lastly blue) even though red grit is less common. Roadkill is a cause of mortality. Hello Nick, great capture of the Swamphen. Thank you so much for linking up your post. Thanks also for the comment and visit. Happy Saturday, enjoy your weekend! I am amazed at how colorful they are! They are so pretty! That is a beautiful photo!